Wondering when to start potty training? There is no 'best' time to start potty training -- only YOU will know when your child is ready. Typically, between 18 and 24 months a child has the cognitive and physical skills to sit on the potty, although some parents start 'elimination communication' as early as 4 months. Helpful tips from parents who've been there. I’ve used Pampers Swaddlers since the day we brought our baby home — because they are soft and absorb well. Plus, Swaddlers have a moisture indicator strip, which helped with my observations of baby’s potty signals. However… after using disposable diapers for 16 months and trying cloth diapers for the first time, I’m honestly wishing I made the switch to cloth diapers sooner! I found a good deal on used cloth diapers that were in excellent condition. See why I’m now a huge fan of Alva cloth diapers with snaps that grow with your baby, how to clean cloth diapers, my tips for stripping cloth diapers of bacteria, and my thoughts on cloth diapers vs disposable diapers today. I’ve been practicing Elimination Communication potty training (with a diaper backup) since my baby was 13 weeks of age. In 1 month he will be a year old, and we are still committed to becoming diaper free. 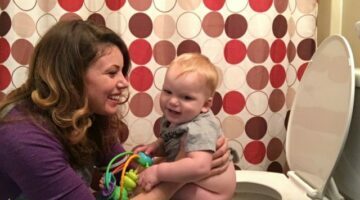 I’ve learned a few things about EC since I first started it — so I thought I’d share the following with others who are considering it: How I’m encouraging my baby to go potty at specific times, What my baby’s potty signals are, What my baby’s diaper-free times are like, The benefits of EC and why I’m sticking with it, The challenges of EC and how I’m working through them. Exploring baby potty training? Have you heard about Elimination Communication? It’s a simpler way to do baby potty training) which focuses on being diaper free at a younger age. We started when our little boy was 13 weeks old. With EC, the diaper is used as a “back-up” instead of a permanent, wearable toilet.